All the case-winning guidance you need to successfully prepare and handle each stage of workers' compensation cases and related proceedings. All the case-winning guidance you need to successfully prepare and handle each stage of workers' compensation cases and related proceedings, both pre- and post-SB 899. Complete coverage of the substantive and procedural aspects of the law, combined with a practical guide to every stage of a case. Includes the text of relevant regulations, tested forms with explanatory comments, and the Post-SB 899 Permanent Disability Rating Schedule. 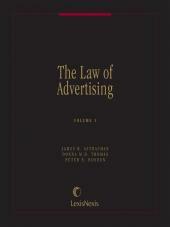 First published in 1966 by Warren L. Hanna (Original Edition). 3 Volumes; Looseleaf; updated with revisions. Kenneth B. Peterson retired as the Presiding Judge at the Workers’ Compensation Appeals Board in Oakland, in November 2009. He served in 2004–2005 as Acting Chief Judge of the Division of Workers’ Compensation, supervising all statewide district court offices, and as Associate Chief Judge, Northern Region, in 2003 and 2004, when he was responsible for overall supervision of the northern court offices from Salinas to Eureka. For the last several years, he has been an active member of the Workers’ Compensation Executive Committee of the State Bar of California. Judge Peterson graduated from Stanford University (B.A., 1971) and University of California, Hastings College of Law (J.D., 1975), where he represented the school in the National Moot Court Competition. Judge Peterson became a Certified Specialist in Workers’ Compensation in 1981. Before becoming a judge, he was a senior partner in the Oakland firm of Smith, Wright & Peterson, from 1981 to 1991, representing injured workers. Earlier, he was an associate at Boxer & Elkind from 1980 to 1981, also representing injured workers, and at Hanna, Brophy, MacLean, McAleer & Jensen in Oakland, representing workers’ compensation defendants, from 1977 to 1980. He began his legal career at the National Treasury Employees’ Union, where he was staff labor counsel from 1975 to 1977. While in private practice, Judge Peterson was chair of the Alameda County Bar Association Section on Workers’ Compensation, President of the Northern California Chapter, California Applicants’ Attorneys Association, and a member of the Bench-Bar Committee of the Oakland Workers’ Compensation Appeals Board. He has lectured at Hastings College of Law, St. Mary’s College, Golden Gate University, California State University, Hayward and the Industrial Claims Association. 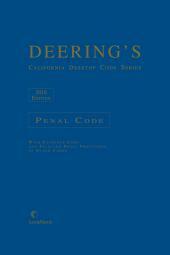 He has presented numerous educational programs for the California Applicants’ Attorneys Association. He was also a consultant and editorial advisor to Nolo Press for its Guide to Workers’ Compensation for Injured Workers, has been Editor-in-Chief of Hanna, California Law of Employee Injuries and Workers’ Compensation for more than 15 years, a charter member of the LexisNexis California Workers’ Compensation Editorial Board, and a member of the Larson’s National Workers’ Compensation Advisory Board. Warren L. Hanna (1898-1987) was the author of the original edition of this treatise. Mr. Hanna, co-founder of what is now the country’s largest workers’ compensation law firm, Hanna, Brophy, MacLean, McAleer & Jensen, was widely recognized as a leading authority on workers’ compensation law in California. He began reporting the decisions of the Industrial Accident Commission while working for the Commission as a referee beginning in 1931. 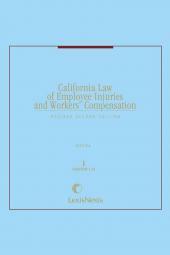 In 1936, the annual volumes of IAC decisions were replaced by California Compensation Cases, published by Workmen’s Compensation Reporter, a company founded by Mr. Hanna. 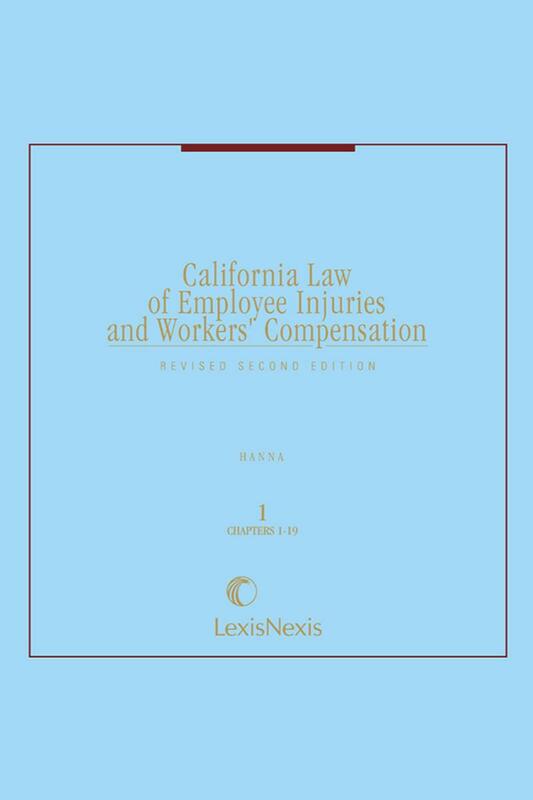 In 1950, the company became Hanna Legal Publications and went on to publish other works, including the first edition of Mr. Hanna’s respected and widely cited treatise, California Law of Employee Injuries and Workmen’s Compensation. In the early 1960’s Hanna Legal Publications sold the publishing rights to several of Mr. Hanna’s works, including California Compensation Cases and California Law of Employee Injuries and Workmen’s Compensation, to Matthew Bender and Company. Mr. Hanna worked closely with Matthew Bender on the Second Edition of this treatise, which was originally published in 1967.  He continued his involvement with this publication, initially as editor and later as editorial consultant, until 1986. Mr. Hanna died on September 28, 1987, ending an illustrious 56-year career in workers’ compensation law.